Pastry filled with spicy potatoes & green pea's masala. Sliced onions dipped in batter and deep fried. Chicken marinated in yoghurt & spices. Tandoor grilled paneer with onions and capsicum. Cubed paneer marinated in specially spiced sauce. Our best selling paneer dish with green marination. Marinated chicken thighs, spiced & cooked in tandoor. Boneless chicken pieces cooked in tandoor. Signature dish with chefs recipe in thick fresh green sauce. Chicken marinated in garlic sauce. Lamb mince rolls on skewers roasted in tandoor. Herbs & spices marinated fish. Yoghurt, herbs & spices marinated prawns cooked in tandoor. Chicken Tikka, Chicken Pakoras, Lasooni Tikka, Chicken drumstick. Creamy tomato gravy with cashew paste aromatic spices. Thick & creamy onion tomato base cooked with capsicum. Cooked in hot spicy red chilli gravy. Cooked in spinach puree a mild blend of spiciness. Oil (Rogan) blended gravy, with exotic blend of herbs & spices. Cooked with coconut cream, curry leaves in a blended gravy. Cashew onion based gravy with cardamom and fresh cream. Gravy with cashew base, crumbled paneer & mild spices. Peppers, onions, chillies cooked in tomato & onion gravy. Chicken cooked with mango sauce in a special recipe. Chicken sauted with onion, capsicum & tomatoes in thick gravy. Chicken cooked in thick sauce with chillies, a must try. Chicken slow cooked with scrapped sauce in exotic flavours. Lamb cooked with Indian Pickles in onion tomato gravy. Sauteed onion & tomatoes and cream garnished with almonds. South Indian styled lamb dish with coconut, dry preparation. 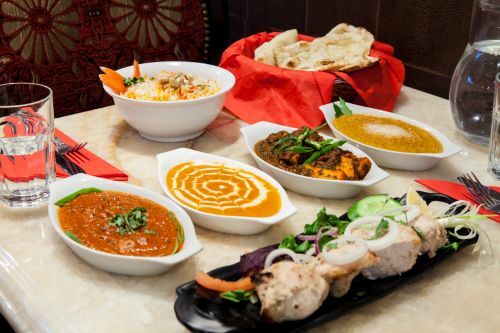 Choose from Chicken/Goat/Lamb cooked in a special way. Chefs special recipe with bone. Seasonal okra cooked in light gravy with vinegered onions. Slow cooked with coconut cream & curry leaf. Tomato Cashew based thick creamy gravy. Must try dish. Scrambled Paneer with coriander, chillies, tomato & herbs. Cooked in tomato gravy with butter, cream and aromatic spices. Fish cooked in coconut & cream, a mild blend of herbs & spices. Pieces of fish cooked with tomato & onion & capsicum. King prawns cooked in a thick curry sauce. Malabari style. King prawns cooked with tomatoes, onions & capsicum. Prawn cooked with spinach gravy. Prawn cooked with vegetables and onion & tomato. Seasonal vegetables tossed in aromatic biryani rice in a special way. Saffroned aromatic biryani rice in a special way. King prawns tossed in saffroned rice in a special way. Seasonal vegetables cooked with cashew nut and white sauce. Seasonal peas with fenugreek in thick white sauce. Chunky fresh vegetables in a blended tomato onion sauce. Diced cut vegetable cook with whole red chilli, very spicy. Mashed potatoes & paneer dumplings cooked in a rich gravy. Paneer pieces cooked in creamy gravy & garnished with cashew. Spinach & cottage cheeses cooked in a mild gravy. Cross cut vegetables in whole ground masala with paneer. Potatoes & peas cooked in mild sauce with ground spices. Potatoes tossed with cumin seeds and cooked in creamy sauce. Chickpeas cooked in tomato and onion sauce. 5 different types of lentils cooked to perfection. Yellow split lentils with tomato cooked in Ginger, garlic & spices. Rice fried with cumin seeds. Rice fried with cumin seeds & peas. Stuffed with potatoes and onion.